We have a Temple Israel alumnus in the house! 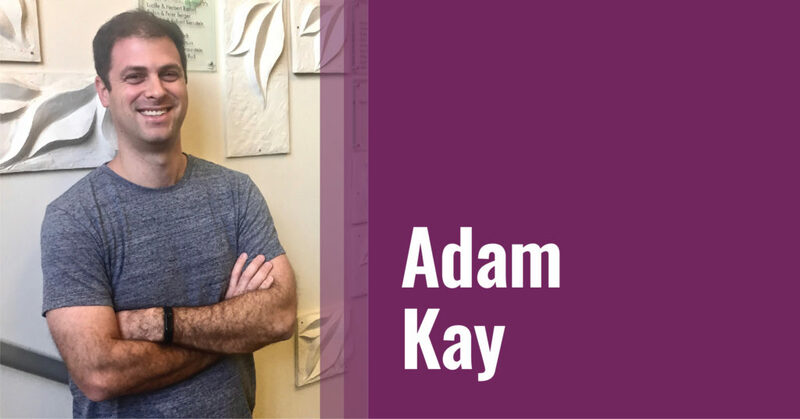 Adam Kay, our first dad featured in Meet A Parent, is no stranger to Temple Israel. Adam grew up as a student in the TI religious school, became a Bar Mitzvah, and was married here. We are excited to introduce Adam to you! Let’s start by finding out about your children. Can you introduce them to us? Rose is our all-star 3 year old. She loves dancing, reading, and chicken fingers. Bella, 9 months old, is twin 1 (she was born first). She has a killer smile and likes to play row-row-row-your-boat. She doesn’t like napping so much yet, which is an issue, but is happy and talkative when she’s awake. Anna, also 9 months old, is twin 2 (younger by 9 minutes). She’s very snuggly and usually a little more subdued than Bella, but is now learning to crawl and pull herself up already, much to the dismay of our under-baby-proofed house. Why did you select TI ECC? We wanted to instill a Jewish identity in Rose from a young age. It was important to us and our families growing up, and so we knew we wanted to send her to a temple for pre-school. The ECC was the perfect balance of both Jewish and secular activities for us. And also the people! Besides my familiarity with TI having grown up here, we got the feeling with every interaction, whether the teachers, the staff, or the clergy, that the ECC was filled with amazing people. Can you tell us about a special moment with Rose at the ECC? Any interaction I get to have with Rose’s whole class is special. Earlier this year, right before Halloween, I did a “Doctor Daddy” day and brought in a whole skeleton — we named him Skippy — as well as some x-rays to teach the kids about bones. What’s the toughest challenge as a modern dad? Finding time for all my kids. Modern dads (and moms) are pulled in so many directions at once, with so many more outside pressures, and a very busy work schedule, that just finding some one-on-one time with any of them is tough. Especially when twins are thrust into the equation. What’s your best dad advice you will tell your children as they grow up? Be honest about your mistakes, own them, and learn from them. Don’t shelter yourself from failure, because it will happen. Do you have a favorite professional sport team? I’ve been a Yankee fan since I was 4 years old. This has been the subject of some internal family strife since Emma’s entire family are all Red Sox fans, so there’s a tug-of-war going on with Rose’s fan-hood. I think I’m winning so far, but we’ll see. One celebrity you would like to have dinner with, and why? Keith Richards. I like the Rolling Stones, though not the hugest fan. But the stories that man could tell would keep me very entertained through dinner. I pitched a perfect game in high school. It was only 5 innings since we were winning by more than 10 runs, but still perfect (no hits or walks) through 5. It was even in the newspaper (in the Westport News at my mom’s request, but still…) My mom still has the article framed somewhere in her house. I have a magic wand and will grant you one wish…what would that be? For unlimited wishes. If that’s off the table, then just good health for my kids. I’ve been a type 1 diabetic for over 10 years, and they have a slightly increased chance of getting it. I’d give anything for them not to have to go through it for their lives, so I’d use my wish that way.